The tour is all about highlighting all that is weird, unique, and awesome about Portland homes. PORTLAND, Ore. -- The Weird Homes Tour is coming to Oregon and will be showcasing unique homes in the Portland area. KGW got a sneak peek of what's in store. One of them is located in Southeast Portland. Take one step into Christine Claringbold's home and it's clear, it isn't your typical house. “I have made this awesome colorful rainbow curtain using old colored vinyl records,” said Claringbold as she motioned to her front window. Walk a little farther, and you pass a wall filled with decorative and colorful vinyl records. Some of them have been made into functional clocks. Arrive in the kitchen, and the ceiling immediately grabs your attention. “This is our kitchen and I collect psychedelic coffee cups. I’ve been collecting them since I was about 16 years old and have quite a variety. 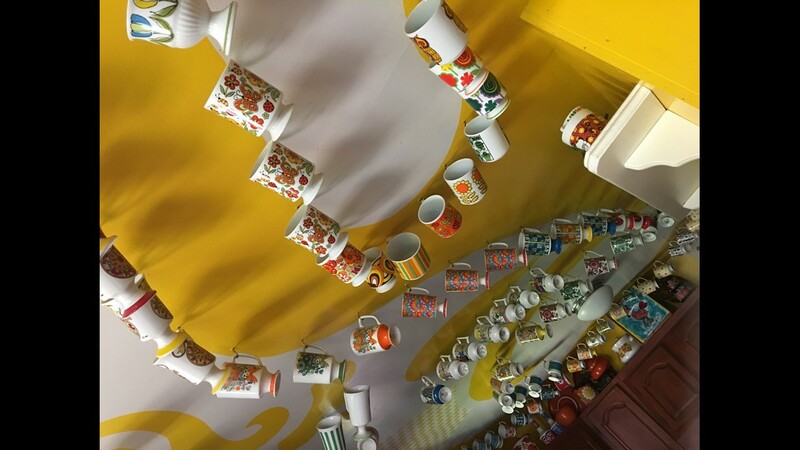 They're all vintage cups from the 1960s, 70s,” Claringbold said. In total, she said there are almost 150 cups hanging from the ceiling. If you count the mugs on the walls, there are more than 200 cups in the kitchen. If that’s not impressive enough, just walk into the bedroom. 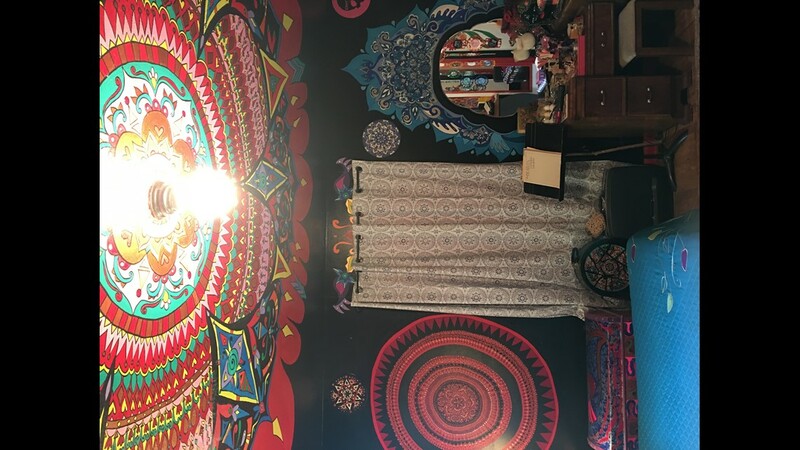 “In here is the psychedelic bedroom. 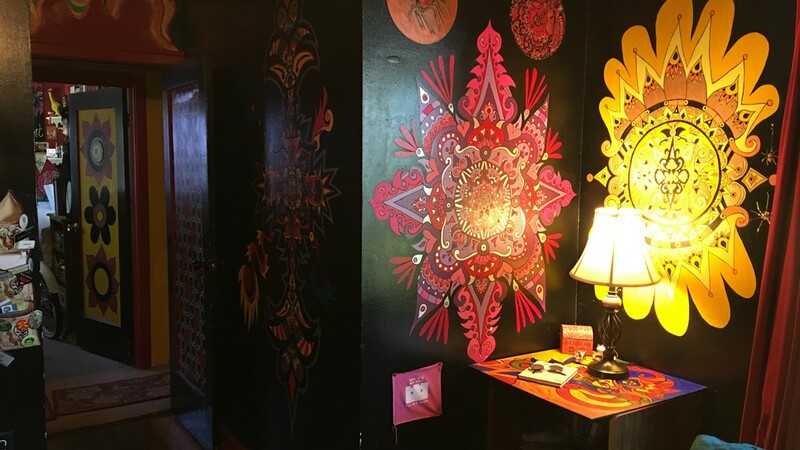 There's mandalas on the walls and ceiling and everything glows in the dark,” Claringbold said. 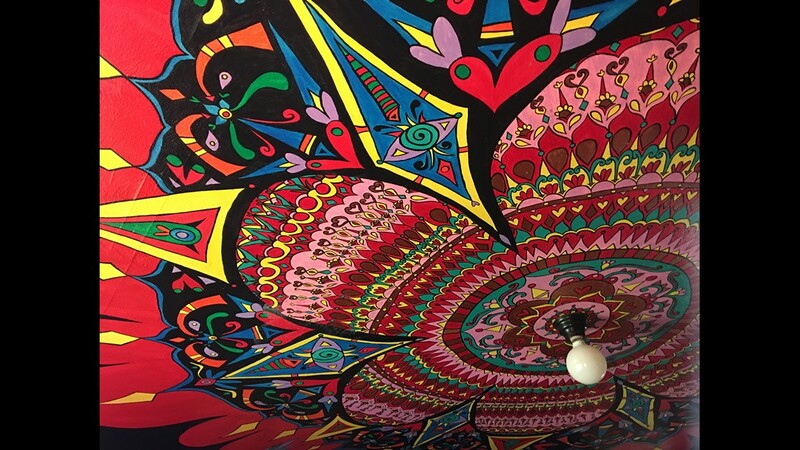 Everything, even the gigantic mandala on the ceiling, is hand painted. She was even featured on an HGTV show called "Look What I Did!" Down in the basement is where Claringbold and her family rock out. She and her husband Charles are in a rock-and-roll band called Dartgun & the Vignettes. Claringbold's home is one of the 8-10 homes that, for the first time, will be featured in the self-guided Portland Weird Homes Tour. 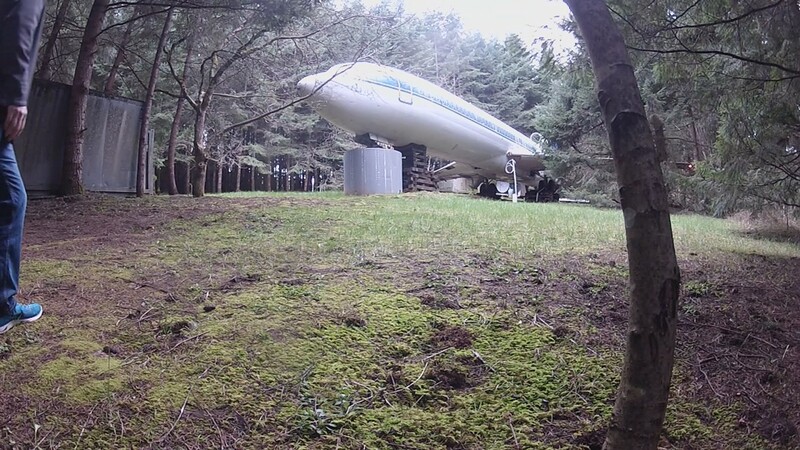 A plane turned home that’s tucked out in the woods of Hillsboro will be in the tour too. It was featured on KGW back in 2016. Over FaceTime, Kevin Shaw who is the Managing Director of Weird Homes Tour said they're still looking for a couple more home submissions. He said there’s no special criteria. “We don't want to put weird in a box. We'll know it when we see it,” Shaw said. When people get to see homes like Claringbold's, the idea of keeping Portland weird is pretty cool. 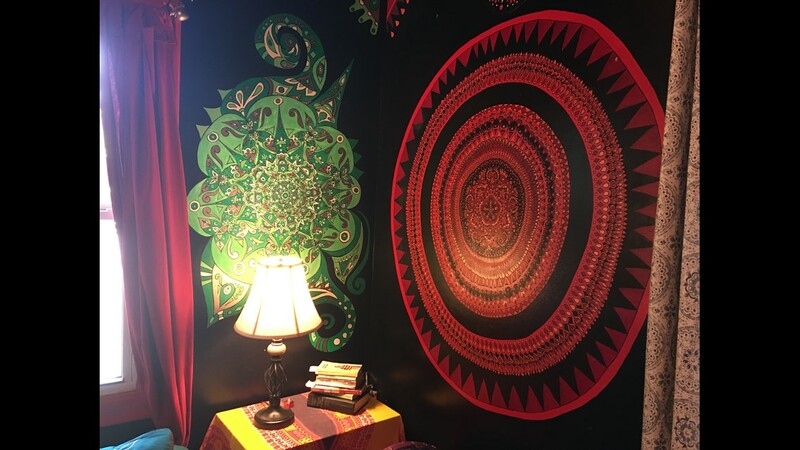 Claringbold also sells products, some of which can be seen hanging in her home, through her Etsy shop, EyePopArt. The tour is coming up on June 30. Tickets are $30 with 10 percent of ticket sales going to Central City Concern to raise awareness about affordable housing. Kristie Perry with Central City Concern said she’s thrilled the organization is a beneficiary. Shaw said the tour is looking for a couple more home submissions from the Portland area. Homeowners who make it into the tour, will receive professional photos of their homes, mention of any business associated with their home, a couple tickets to give to friends or family, and the ability to sell any products at their home on the day of the tour. If someone refers a home and it makes it onto the tour, the person will also receive a pair of tickets. The tour is self guided. People who buy a ticket will get a map and a list of homes. They will be able to explore the homes at their own pace from 10 a.m. - 6 p.m.